Dilmaghani, M., Ahmadi, M., Zahraei-Salehi, T., Talebi, A. (2011). Detection of Salmonella enterica Serovar Typhimurium from Avians Using Multiplex-PCR. Veterinary Research Forum, 2(3), 157-165. Mahdi Dilmaghani; Malahat Ahmadi; Taghi Zahraei-Salehi; Alireza Talebi. "Detection of Salmonella enterica Serovar Typhimurium from Avians Using Multiplex-PCR". 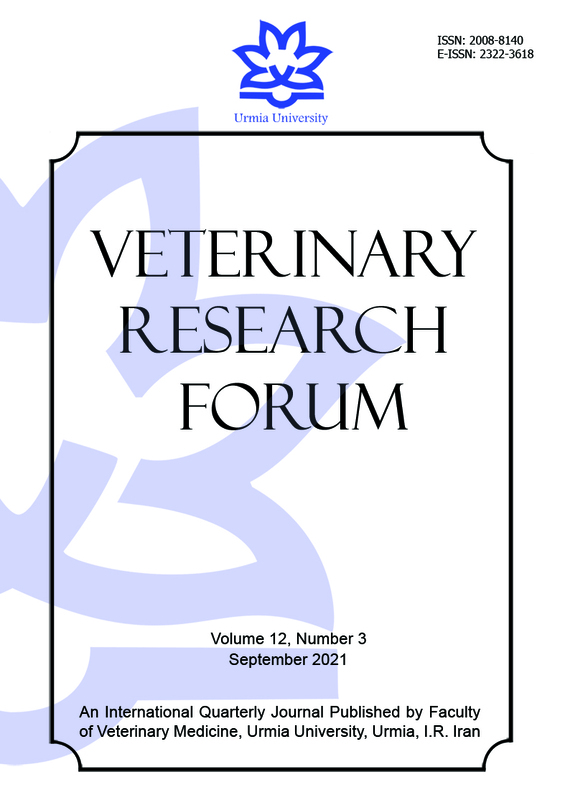 Veterinary Research Forum, 2, 3, 2011, 157-165. Dilmaghani, M., Ahmadi, M., Zahraei-Salehi, T., Talebi, A. (2011). 'Detection of Salmonella enterica Serovar Typhimurium from Avians Using Multiplex-PCR', Veterinary Research Forum, 2(3), pp. 157-165. Dilmaghani, M., Ahmadi, M., Zahraei-Salehi, T., Talebi, A. Detection of Salmonella enterica Serovar Typhimurium from Avians Using Multiplex-PCR. Veterinary Research Forum, 2011; 2(3): 157-165. Salmonella enterica serovar Typhimurium and S.enterica serovar Enteritidis are the most frequently isolated serovars from food-borne diseases throughout the world. According to their antigenic profiles, salmonella shows different disease syndromes and host specificities. It is necessary and important to discriminate salmonella serovars from each other in order to ensure that each pathogen and its epidemiology are correctly recognized. Many PCR-based methods have been developed to identify salmonella serovars. The objective of present study was to identify S. Typhimurium in avians from different regions including: North, Northwest and capital city (Tehran) of Iran. Also in this research, the quality of CHROMagar™ Salmonella medium (CAS medium) in veterinary medicine was evaluated. The results of present study showed that out of 1870 intestine samples, fifty two S. Typhimurium including broiler (n=13), layer (n=12), duck (n=5), goose (n=5), sparrow (n=8), canary (n=3), pigeon (n=5) and African grey parrot (n=1) were identified using serotyping as well as multiplex-PCR. In conclusion, important measures must be taken on prevention and propagation of S. Typhimurium among avians. CHROMagar™ Salmonella medium has high levels of sensitivity and specificity and reduced the time to final identification of salmonella spp. in comparison with biochemical tests.